A major carving technique introduced in the later half of the 10th century was yosegi-zukuri 寄木造. Up until then, statues were carved from a solid block of wood using a technique called ichiboku-zukuri 一本造. The new yosegi-zukuri technique reached its apogee with Unkei (1148 - 1223 AD), one of Japan’s most highly acclaimed sculptors. Instead of using one solid piece of wood, Unkei and his team carved the statue in a piecemeal fashion from partially hollow blocks of wood. First, the individual body parts were carved roughly and separately. Second, the pieces were assembled, and only then, thirdly, did detailed carving begin. Some Japanese sources say the yosegi-zukuri method was introduced in the later half of the 10th century, due primarily to the lack of large trees and a growing creative impulse to create gigantic statues of the Nyorai and Bosatsu. Others say the technique stems from Jocho, the great Buddhist sculptor (died 1057AD) who is credited with the outstanding Bosatsu on Clouds and Amida statue found at Byodo-in Temple. For more details on these pieces, please visit the “Bosatsu on Clouds” page at the main site. 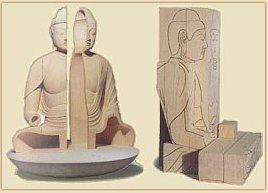 Single-block carvings are also known as natabori 鉈彫 (literally “hatchet carving”), but they are differentiated from ichiboku-zukuri carvings by the characteristic round chisel (nata 鉈) markings left on the statue’s surface. Natabori images are rough-cut (arabori 荒彫) or fine-cut (kozukuri 小造り) without undergoing the finishing (shiage 仕上げ) process, and for this reason, some Japanese claim that natabori are unfinished works, while others claim that natabori statues are a unique sculptural style. In the Edo Period, two wandering artists of great fame revived this technique. They were the Buddhist priest Enkuu (Enku) 円空 (1632-1695) and the Zen priest Mokujiki Myouman 木食明満 (1718-1810). Nearly all of their extant pieces were carved from a single block of wood, including the pedestals, and were not hollowed out. This gives their pieces a freshness that is completely different from the refined works of traditional Buddhist sculpture.